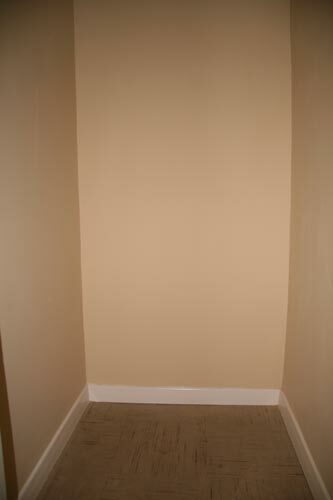 Friday: time to put the freshly painted under-stairs cupboard (a.k.a. cellar) back together again. First job is put up some coat hooks to replace the rail that was removed along with the original shelf. Fortunately we have a set of six hooks on a wooden backboard unceremoniously holding up brooms in the garage. Remove hooks, rub down the backboard and freshen up with a nice new coat of quick-drying varnish. It fits a treat; so far so good. Now in with the wine-rack-support-and-walking-boot-storage device. It fits beautifully. There’s one slight glitch: the floor isn’t level so the shelf sits tipping forward slightly. 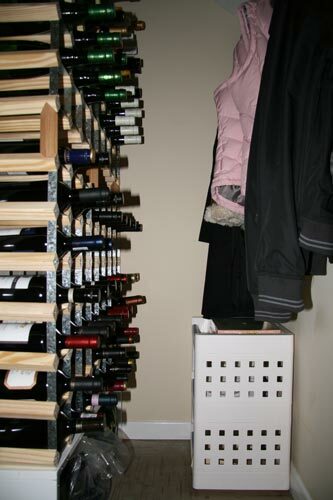 This will mean that the wine racks do not sit back against the wall (and if they do, they won’t sit on the wine-rack-support-and-walking-boot-storage device). Back to the garage to make a couple of 4mm wedges. Wonderful, we’re level now; on with the first wine rack. For some reason, call it a sixth sense (aside: excellent film first time around, “Sixth Sense” with Mr. Willis – naff thereafter, though, once the surprise has gone), I grabbed a couple of wine bottles and sat them in the rack. Ah, my sneaky, painstakingly made wooden support device, which are actually butchered bits of old similar wine rack, do tend to get in the way of bottles a tad. Shame really, since bottles are the entire raison d’être of this 5-day venture. (Another aside: strange how decorating a measly space less than 1m x 1m takes as long in elapsed time as a 4m x 4m room, isn’t it? It’s the drying time that’s the problem.) 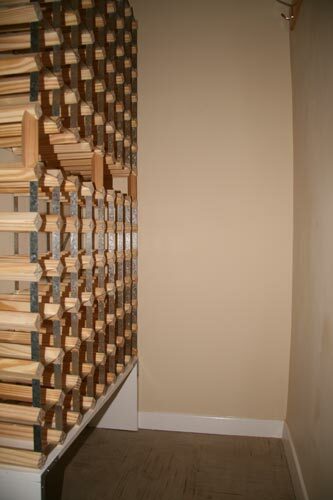 I’d made six supports to go in between the two wine racks, three for the back and three for the front. The back ones do not allow room for the bottle to sit in the rack. The front ones are fine because bottles (most of them, anyway) neck down nicely at the, well, neck. (Black Tower bottles are a notable exception but we will absolutely never blow our street cred by admitting to having any!) Since everything is fixed to the wall with screws capable of holding up the Titanic, it’s really only the front supports that are necessary. So, dispense with the rear supports altogether and on with the plan. Second wine rack fixed above the first wine rack; glue in the painstakingly made front support legs. Wonderful, it all looks very good. I am having a crisis here. I type in a comment, click on a pictire and lose my comments!! Anyway, good pictures! So agree about the film, os much better than the dreaded Nicole Kidman “The Hours”. What’s on the floor underneath the rack and what’s the capacity?!!! steve says will you fill it on caravan outings?